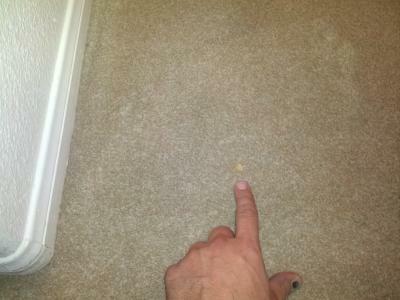 San Diego ca Carpet Cleaning - Bleach on CarpetsHow do you remove bleach stains on carpet? There is NO reason to have to replace the carpet. 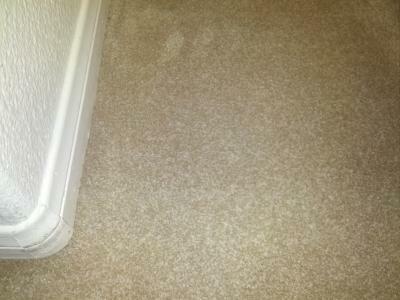 Bleach spots can be easily and perfectly repaired by a carpet dyeing professional. Depending on the skill level of the dye technician, the spots can be re-dyed, bringing them back a perfect color match with the surrounding carpet. The dyes are completely permanent and will not come out when the carpet is cleaned. The dye technician will first neutralize the bleach in the carpet to deactivate it (this cannot be done by simply rinsing with water. The bleach must be neutralized chemically or the spots will simply continue to fade out due the presence of active bleach). The technician will then determine which colors have faded out of the carpet and will then replace ONLY the missing colors in the exact percentages. Many do-it-yourselfers and/or inexperienced carpet cleaners will attempt to fix bleach spots with terrible results. This is usually due to the fact that they have not been properly trained in color theory. The technician must take into account any EXISTING color(s) that are still present in the bleach spots. For example, if there was a green carpet that had yellowish-looking bleach spots on it, it is highly likely that the bleach spots would only require the addition of blue (yellow + blue = green) to restore them. If one were to apply a green dye to the spots, they would likely turn out looking the wrong shade of green (too yellowish) because the green dye that was applied also contained yellow which was not needed. Carpet dyeing professionals may be located by doing a web search or by looking in the Yellow Pages under the heading "Carpet & Rug Dyers"